This section is from the book "Commercial Gardening Vol2", by John Weathers (the Editor). Also available from Amazon: Commercial Gardening, A Practical & Scientific Treatise For Market Gardeners. From this has originated the florist's Chinese Primula, which for many years has been a favourite with market growers. Fig. 297 shows the loose and graceful habit of the typical' species, which of late years has again become fashionable in private gardens. The dwarf florists' varieties, however, are preferred for market work, as they are easier to transport and do not require so much care in packing. The red- and white-flowered varieties are perhaps most popular, but there are all shades of colour(except yellow), among them being scarlet, crimson, mauve, lavender, pink, and intermediate shades. Seeds of the Chinese Primula (in which, of course, a good trade is done by specialists) are sown in March, April, and May in order to secure a succession of bloom from early to late in the season - from October onwards. Some care is taken in properly draining the pots, pans, or boxes in which the seeds are to be sown, and a compost of 3 parts loam, 1 part sand, and 1 part well-rotted manure or leaf mould is used, although some growers have loam and leaf mould in about equal proportions. The soil is watered before the seeds are sown. Thin sowing is the rule, and the seeds are just covered with some fine gritty mould. They germinate irregularly in a temperature varying between 50° F. at night and 70° F. by day. When large enough to handle easily the seedlings are pricked off about 1 in. apart into pots, pans, or boxes in a similar compost, and are placed in a somewhat shaded part of the greenhouse until again established. The seedlings are next moved singly into 3-in. pots, but specially large plants may be placed at once in 5-in. pots. In all cases the plants are potted so that the soil comes well up to the collar. During growth, attention is given to careful watering, and a sprinkling overhead two or three times a day is usual in genial weather when the plants are in the early stages of growth. During the summer months - from June till the end of August - the plants will do well in a cold frame, or in a greenhouse with a northern aspect. Abundance of fresh air and diffused light must be available during this period to keep the plants sturdy, but they must be protected from very strong sunshine as well as cold biting winds and an excess of moisture. Besides the single-flowered varieties a pure-white double-flowered one is also grown, and was once very popular for cut flowers with florists, and realized from 12s. to 20s. per dozen bunches years ago; but those days are long past, and prices have dropped considerably. For pot plants the average market price now varies from 3s. to 6s. per dozen. Fig. 297. 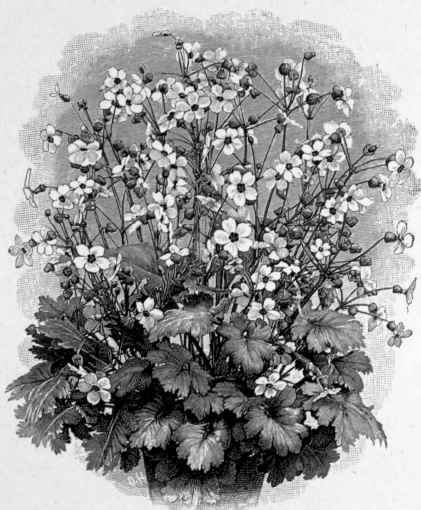 - Primula sinensis.